The convertible SEQ Urban Coat by AGU fits both fashion and function, transforming into a rain poncho perfect for biking. With the belief that bicyclists should not have to buy a separate wardrobe for their passion, the gorgeously fitted hooded jacket meets the discerning fashionista and the adventurist. Should sudden rain erupt, the jacket zips open to create a drapey poncho that protects the cyclist’s hands from impending rain. Designed in-house by AGU, the stylish rain jacket comes in a neutral silver grey, or patterned blue and white. 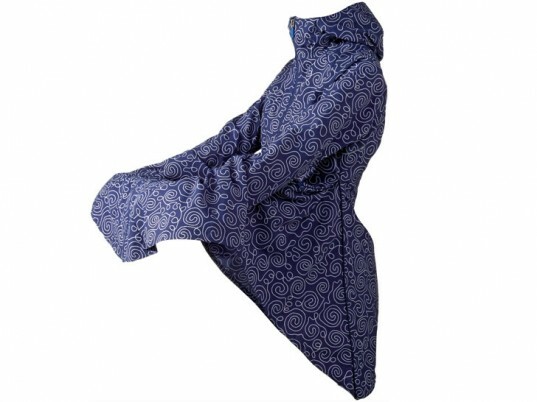 Gathered at the waist and flaring into a flattering A-line cut, the jacket appears to be the typical fashion raincoat, complete with comfortable hood. The waterproof material deflects rain as well as wind, and is also totally breathable to make for comfortable walking or riding. But aside from looking good, the jacket also comes in handy should a storm erupt while on the road. The SEQ has its own internal system that can transform easily into a poncho, even while still cycling. With an unfurl of the zipper, the jacket becomes a poncho that can be draped over the handle bars, protecting the rider’s hands from the onslaught of cold rain. Internal “gloves” are built-in, giving the cyclist a better grip on the handle bars should they become slippery. This simple yet effective transition makes for easier riding and control that won’t require stopping during the journey. Whether on bike or off, the lightweight coat looks good enough to wear day to day. The convertible SEQ Urban Coat by AGU fits both fashion and function, transforming into a rain poncho perfect for biking. With the belief that bicyclists should not have to buy a separate wardrobe for their passion, the gorgeously fitted hooded jacket meets the discerning fashionista and the adventurist. Should sudden rain erupt, the jacket zips open to create a drapey poncho that protects the cyclist�s hands from impending rain.